Placed at a height of 7600 ft, Binsar Forest Retreat is a perfect mélange of comfort, luxury and adventure. 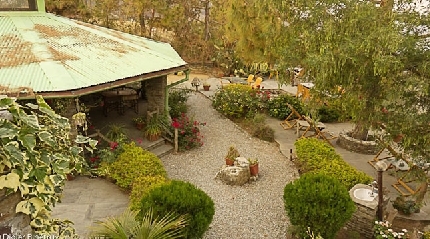 The retreat is located on the southwest of Binsar Wildlife Sanctuary. The scenic beauty and serenity of the place beckons guests from different parts of the country. The history of Binsar dates back to the period of British Raj when the site was owned by Major Edin; back then it was known to be Edinpur. Binsar Forest Retreat is well-equipped with all facilities and boasts of amazing airy verandah’s balconies and open deck. There are six accommodation options planned with different themes and names. 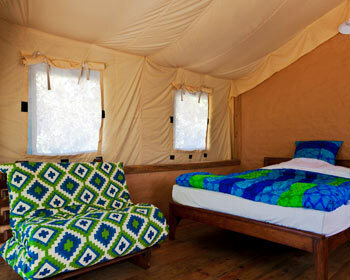 And out of six, one accommodation type showcases four luxury tents, which will give you a feel of camping in forest. Each room is well-facilitated with modern amenities and showcases eye-catching interiors. From each accommodation type guests can enjoy impeccable scenery and greenery. 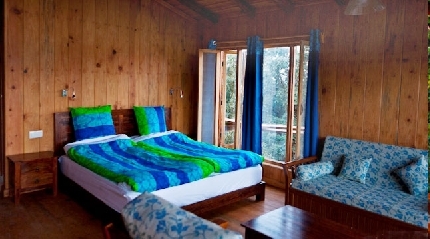 In fact, few of the rooms offer attractive views of Nanda Ghunti Peak and Trishul Peak. There is a simple dining area where guests can savor cuisines of their choice. Other than just relaxing and enjoying the Binsar facilities, guests can also go on short trips to local attractions of the place such as Binsar Wildlife Sanctuary. The sanctuary is home to countless variety of fauna such as barking deer, mountain goats, porcupines, macaques, leopards and wild boars. Guests can go on jungle walks, indulge in jeep safari or discover new trekking routes in lush jungles. Binsar is not only entertaining but also spiritually inspiring. There are several holy shrines in proximity to Binsar namely Kasar Devi Temple, Chitai Temple, Jageshwar Temple and Mukteshwar Temple. There are two Trishul Rooms located at the top floor from where you can enjoy breathtaking views of Trishul Peak, visible from anywhere in the room, as the name suggests. The rooms are close to each other with maximum space for four guests (2 adults+2 children), each. The interiors are beautifully arranged with wooden-floor and paneled walls. 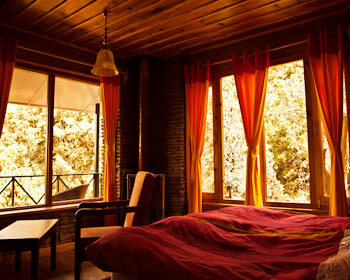 Trishul Rooms also feature a verandah that overlooks Himalayan peaks and lush forests. The in-room facilities at Trishul Rooms are a single seat sofa, reading lights, Bukhari (wood stove), hot water, electricity, covered deck, king-size bed and a sofa that can be converted into a bed. There are two easy chairs provided to relax in open verandah. Chestnut Room come with great space and more to relax. The Chestnut Room traces its name from a Chestnut tree that is planted in the verandah. There is enough space for four people (2 adults + 2 children). Chestnut is designed with mud wall on two sides, wooden floor and glass doors on two sides. The room is well-facilitated with all necessities such as king-size beds, sofa that can be transformed into a queen bed, two single seat sofas, reading lights, hot water, Bukhari (wood stove) and two outdoor chairs and stool. There is a verandah where guests can connect with nature in privacy and tranquility. Enjoy awe-inspiring views of Nanda Ghunti Peaks from the tranquil Nanda Ghunti Rooms. Nanda Ghunti Cottage features two rooms which are almost similar and adjacent to each other. It has maximum space for two adults and one child. 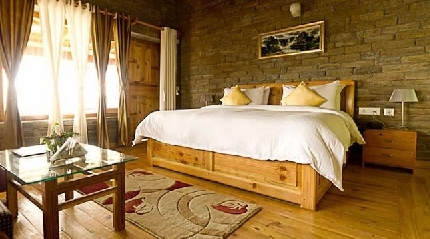 The rooms are airy and designed with stone walls, wooden-floor and wood paneling. There is balcony that joins the lush forest. Guests can sit in their balcony, adore the picturesque surrounding and feel the fresh ambience. 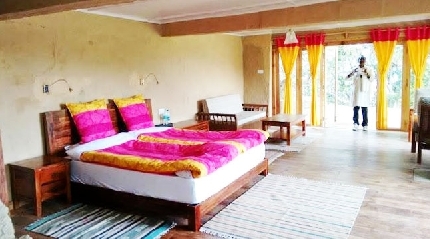 Some of the facilities that guests can enjoy at Nanda Ghunti rooms are Queen-size bed, hot water, reading lights, sofas, Bukhari (woodstove) and two chairs for sit-outs. 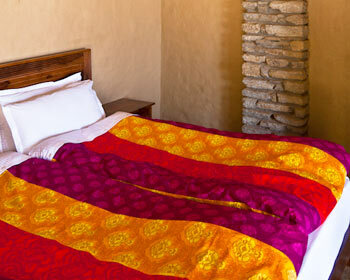 Put-up in Kumaoni style, Rhododendron Cottage serves its guests utmost comfort. There are two rooms settled close to each other and have space for four guests, (two adults + two children), each. In the front setting of these rooms there is a Rhododendron tree that adds a red tinge to the front of the rooms. 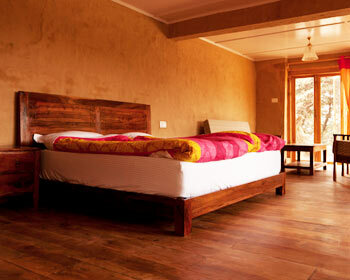 The rooms have mud walls, bamboo mat ceiling and stone floor. Both the rooms come with a common verandah from where guests can enjoy spectacular sunset. The in-room facilities provided at Rhododendron are Bukhari (wood stove), reading lights, one sofa, two outdoor chairs and stools and hot water supply. Gracefully designed with stone and wood, Walnut Cottage boasts of traditional styles. The cottage is named after a walnut tree that is planted near the cottage site. The cottage constitutes of a deck and a verandah to loosen-up and unwind. The cottage has space for four guests (2 adults + 2 children). Walnut cottage is fully-equipped with all necessities such as king-size bed, hot water, Bukhari, sofa and chairs for sit-outs. Binsar Forest Retreat offers unmatched experiences of tented camps. There are total four tents that are located in different areas of the property. Each tent can be shared by three guests (2 adults + 1 child), each. The tents are designed in a way to provide proper comforts to its guests. These are Swiss Cottage tents that that have tin roof and wooden floor. 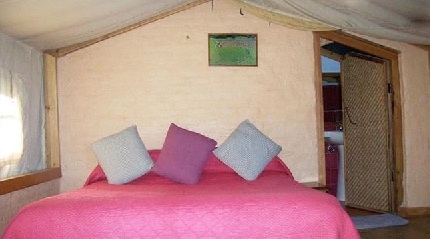 The tents are well-set with en suite washrooms and feature a private verandah for some alone-time. Each tent is well-facilitated with all amenities like hot water, Queen-size bed, a sofa that can be converted into a bed and outdoor chairs. 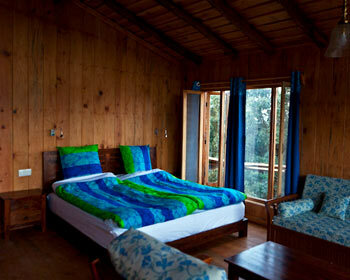 In order to make your stay comfortable, Binsar Forest Retreat comprises of six accommodation options. 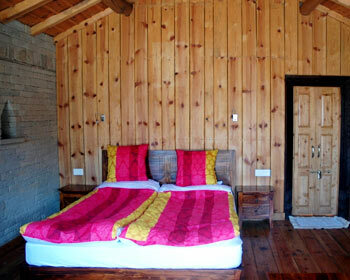 All cottages and tents are well-designed with striking interiors and are well-set with all amenities. Some of the common in-room services that are served at all cottages and tents are morning-tea, breakfast, lunch, evening tea and dinner. Guests can also go on daily walks with guide. 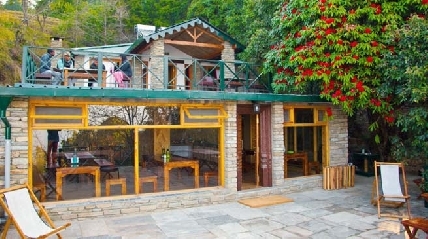 Binsar Forest Retreat has fine dining area where guests can savor lip-smacking dishes of their choice. All meals are served in the dining room. The menu here comprises of North-Indian, Continental and Kumaoni dishes. Guests can order the food according to their own preferences. There is a lounge in the corner of dining room with a wood stove, Bukhari. Guests can sit in the lounge with a book or savor their meals besides the wood stove.